Anna Bolton | Greene County News Allison Mackey watches as her son Isaiah Mackey from Hanover, Indiana practices soddering in the Youth Tech area of Hamvention May 18. Isaiah’s dad is a licensed amateur radio operator; this was their family’s first time at Hamvention. Grace Lea, KM4TXT, works at the youth table. Her mom and sister attended Hamvention as well. 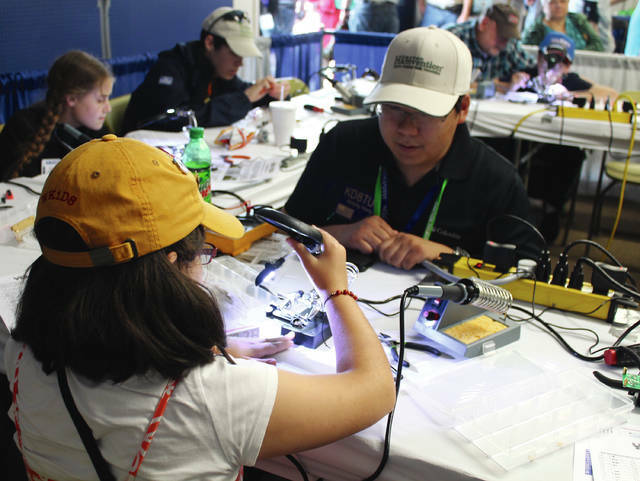 The Youth Tech area provided kids ages 9-18 with soddering tools and technology kits to help teach useful skills related to amateur radio. XENIA — Hamvention kids walked away from the fairgrounds May 18 with their own wireless Tesla speakers and digital clocks — built with their own hands. 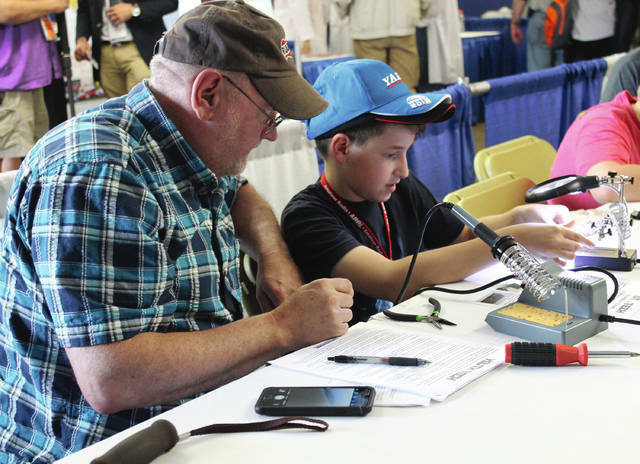 The amateur radio convention’s Youth Tech area, sponsored by Dayton Amateur Radio Association (DARA), provided a space for youth ages 9-18 to build their own technology kits. Ullery, from Dayton, pointed out a boy working on a wireless Tesla speaker. “Essentially when he’s done with it, he can plug it into any audio source such as his phone,” he said. Ullery got involved with similar kits when he was a kid. He said he got his license after his neighbor introduced him to ham radio. After graduating, he became an electronic engineer. “My point of doing this is kind of a selfish thing but there may be some kids here like I was that this gives them that spark, that interest that they may want to grow up and do this someday, too,” he said. Now, Ullery and his wife and daughter are all licensed ham radio operators. 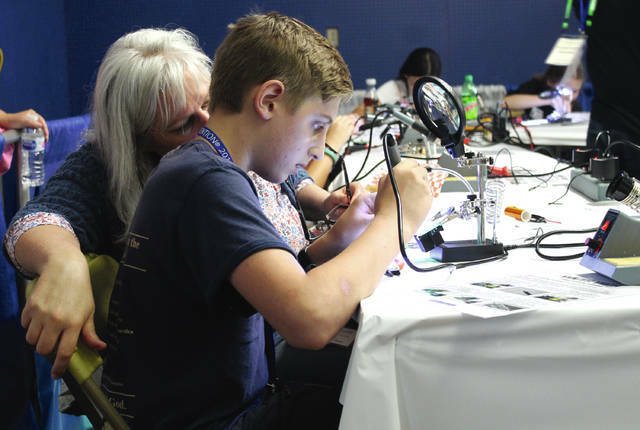 https://www.fairborndailyherald.com/wp-content/uploads/sites/50/2018/05/web1_Mackeys-1.jpgAnna Bolton | Greene County News Allison Mackey watches as her son Isaiah Mackey from Hanover, Indiana practices soddering in the Youth Tech area of Hamvention May 18. Isaiah’s dad is a licensed amateur radio operator; this was their family’s first time at Hamvention. https://www.fairborndailyherald.com/wp-content/uploads/sites/50/2018/05/web1_YellowHat-1.jpgGrace Lea, KM4TXT, works at the youth table. Her mom and sister attended Hamvention as well. https://www.fairborndailyherald.com/wp-content/uploads/sites/50/2018/05/web1_YouthTech-1.jpgThe Youth Tech area provided kids ages 9-18 with soddering tools and technology kits to help teach useful skills related to amateur radio.